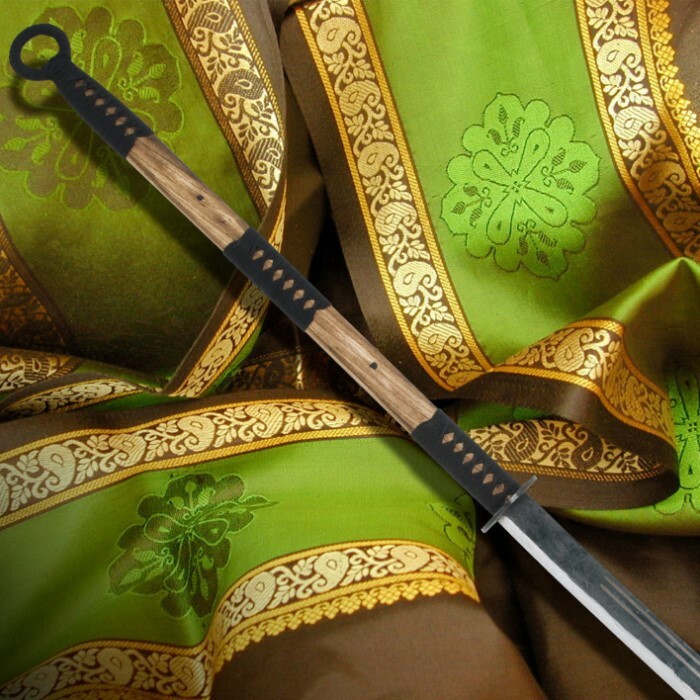 The massive naginata style blade is 27 3/4" long and equipped with deep double blood grooves. The solid hardwood handle is finished with black nylon cord wrapping. This primitive sword is constructed for functional action"¦..No frills or lace, just one big piece of mean steel. 53 1/2" overall. I just picked mine up from the post office and it is everything I expected and more! For $35.00, I am going to order 2 more, this is a great deal for the price! If you are considering getting one of these, DO IT while you still can. 5 stars all the way, thanks BudK! Customer service was excellent too! I will order from them again and again. This is a very nice sword. it's powerful, has a nice balance, and is overall very much worth what you pay. My only little complaints are that when you first swing it. the wood tends to squeak and one of the three wrapping on it came undone, but it's really not much of an issue. I looked it over very thoroughly and can assure you it is a very good, full tang weapon. this is NOT a purchase you will regret! I bought this as a present for myself. It looks great among my Indonesian wall masks & exotic fish tank. The blade on this is a beast. The nag has a really easy, surprisingly light swing to it, and nice balance. Works great in the battlefield too. Use this to chop the legs off cavalry horses, then take out the rider. You can also leave this at home so your woman can ward off brigands & invaders while you're off at war. Get two; one for you, and one for her. No dowry gift quite says "I love you" like this does. Really ups the ante in your next kendo match too. I found this Naginata Sword sturdy and having good balance. 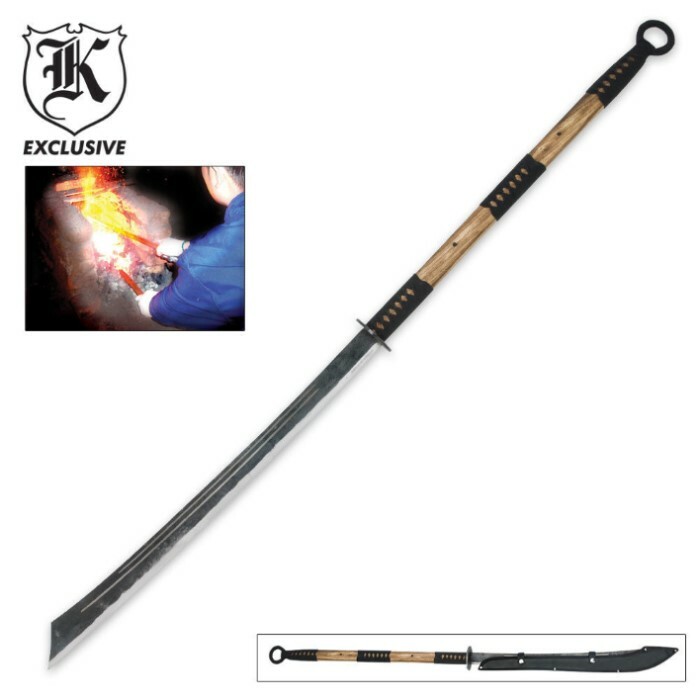 This is a nice sword for practicing samurai techniques. This sword has a good but manageable weight which provides realism when practicing swordsmanship. This thing is absolutly awesome im amazed at how light it is for the size. it didnt come very sharp but i fixed that pretty quick. when its sharp the power u get from the long handle is great u can chop or slice threw pretty much anything. ive already sliced threw some saplings,alot of fruit,and some water bottles of various kinds and the edge hasnt even worn on the blade. All together an AMAZING blade. I have had to re-wrap the handle after I broke all the wooden handle off. Old bicycle inner tubes and about 4 square feet of leather and more inner tube and the original cord wrap work perfectly and provide excellent grip when destroying thick tree limbs and old thorn vines alike. Next to the United full tang katana and black o'dachi, this naginata is my favorite functional piece. So glad I ordered this, it is awesome, just got it in today. I ordered it on Friday, received it on Monday. It's surprisingly light for its size, not very sharp but that can and will be fixed. I would highly recommend it to any collector.